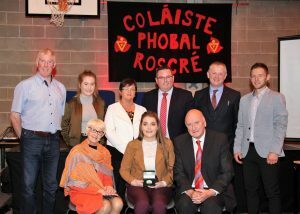 Nicole Brooks represented Coláiste Phobal Ros Cré in the Munster Schools Indoor Combined Events recently. The competition was held in the Nenagh Indoor Arena. There was a good participation level with approximately 30 athletes in the Minor Girls events. The hurdles was the first event of the day. Nicole ran in the second heat. There were some very strong athletes and Nicole did very well to finish in 6th place overall. Next up was the high jump. Nicole looked very comfortable throughout this, her strongest event. She jumped a massive 1.5m which won her 1st place. It was a personal best for Nicole. It was on then to the shot putt. Again Nicole performed brilliantly, with throws of 8.73m, 8.6m and 8.7m. She came 3rd, with a throw of 9m taking 1st place. A fine performance so far with Nicole in 4th place overall. Hopes were high that she would be in with a shout for a medal, but the final event was a tough 800m race. Nicole got boxed in coming around the first bend, and unfortunately never really recovered. She finished 8th overall in Munster which is a very fine achievement. It was her first time to take part in this multi-event competition. It has showed her depth of talent and we hope to see much more of Nicole on the track and field throughout the year. 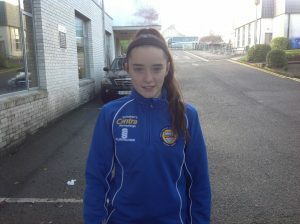 Many thanks to her Dad and coach Brian England who accompanied Nicole on the day. Well done to all! Carmel Cunningham and Dr George Cunningham presenting the Cunningham Medal to Gráinne McNicholas. Pictured back row: O. McNicholas, C. McNicholas, T. McNicholas, Mr O Connor, Mr Flynn and Mr Fitzgerald. 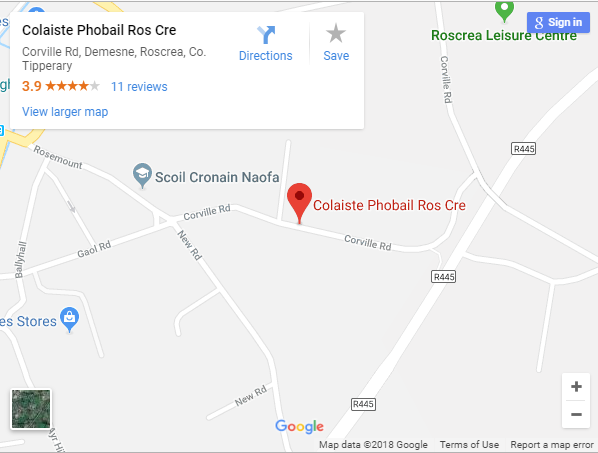 On Wednesday the 25th October the students of Coláiste Phobal Ros Cré gathered in St Crónan’s Church for the ‘Blessing of the Academic Year’. The theme of the service was ‘The Voyage’. Mr Haugh with the help of Transition Year students had created a boat to portray the theme to the student body. During the service Father Lorcan reminded us of the importance of friends and family and how we need them all as we go through our voyage through life. He reminded the student body that we are all members of the same family in Coláiste Phobal and that there is always someone there to help when problems arise. Later in the service a student from every year group laid a symbol on the boat while Father Lorcan commented on some of the challenges often faced by each year group. The choir sang ‘The River’, ‘You’ve Got a Friend’ ‘How Far I’ll Go’ and ‘Count on Me’. Their expressive music reiterated the theme of the service. Mr O’Connor then addressed the student body and spoke about his hopes for this academic year. Members of The Student Council and the Prefects were then presented with their badges for the year. 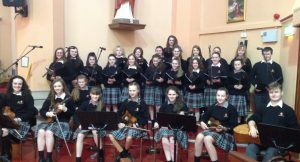 Margaret Harty (Head Girl), Eimear Gleeson, Ciara Hogan, Aoife Tynan, Emma Wright, Josie Poyner, Isra Saleem and Róisín Guidera. Neil Maher (Head Boy), David Jones, Dan Ryan, Jake Delaney, Valentinas Derbutas, Graham Fahy, Cian Fletcher and Nathan Finnerty.